"... He's really got something going on with that BBQ sauce there ..."
That's the general consensus after trying out some of PJ's BBQ sauce at a picnic in the webmaster's back yard to sample these products. BBQ Sauce - available in 22 oz (net weight) bottles. For All Meats And Vegetables in 10 oz. package. like the 2.4 oz Shopp'n Bag Joe's Spicey Sprinkle. "I put it on everything that can use anything sprinkled on it. I use it on meat and vegetables, cucumbers, fries & baked potatoes." 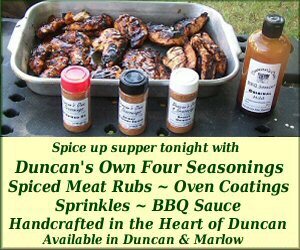 Duncan's Own Four Seasonings used for beef, poultry, pork and fish, plus all styles of vegetables. Contains no MSG. Low sodium. In our Seasoned Flour Mix we use only naturally stone ground whole wheat and a 7 grain flour with natural cornmeal. We invoice via PayPal to assure the best security possible and never have access to your credit card information. Meat Rubs, Seasoned Flour Mix, BBQ Sauce and more to come! "Great River Organic Milling Co."
"Quality Assurance International" San Diego, Ca.